Translucent polymer clay captures the interest of polymer clay artists all over the world. 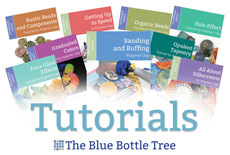 Although the instructions for using it are no different than with any polymer clay, there are unique qualities and factors that do affect how you use translucent polymer clay. I’ll try to cover some of the most commonly asked questions that I hear people ask. What are the brands of translucent polymer clay? All of the major brands of polymer clay carry a translucent in their color ranges. This includes Fimo, Premo, Kato Polyclay, Sculpey III, Cernit, Pardo Professional Art Clay, and Pardo Jewellery Clay. Why isn’t translucent polymer clay the same as transparent clay? No brand of polymer clay is completely transparent like glass (though you can get some very nice glass-like effects with translucent clay). Instead, polymer clay can only be translucent. Some brands are more clear than others, and thinner pieces of any brand of translucent clay are going to be more clear than thicker pieces. Does translucent polymer clay only come in clear or does it come in colors as well? Cernit, Pardo, and Fimo make an entire range of colors of translucent polymer clay. Kato, Sculpey, and Premo just have uncolored translucent. You can see many of them here in my article on Pardo Colored Translucent. How can I color translucent polymer clay? Translucent polymer clay is essentially uncolored. You can easily mix colors into the clay to make it any color you desire. However, you have to be careful that the color you are adding isn’t too opaque or your mix will lose translucency and become more opaque. Alcohol inks are dye colorants and work very well for tinting translucent clay into vibrantly colored mixes without losing clarity. I wrote an article describing this process in detail. You can also use various art supplies into translucent polymer clay to get the color you like. Some materials work better than others, of course, and you can read all about this here. What are the characteristics of each brand of translucent polymer clay? I did an experiment and wrote an article comparing the clarity of different brands of translucent polymer clay. Please refer to that article for information on which translucent clay is the clearest. But just as each brand’s regular opaque clays have their own working qualities, each brand’s translucent clays are unique as well. I’ll try to summarize my impressions. This clay is quite soft and sticky, it has a consistency sort of like cookie dough, and it gets more sticky the more you work with it. It bakes up quite opaque and is sort of a pinkish tan color with a matte finish. The finished clay is quite brittle and will break if used in thin pieces. Fimo Effect Translucent handles very well, it’s firm but not too firm, and slices cleanly. It behaves well in the pasta machine and doesn’t get sticky. It bakes without color and is quite strong, but isn’t particularly translucent. The baked finish is not particularly matte and not shiny, either. Fimo Professional doesn’t have a translucent clay in their range. Premo is a good all-around polymer clay but tends to get quite soft and somewhat sticky when it gets warm. It bakes up very strong, quite clear, but it does have a tan color cast to it. Premo takes and hold impressions very well. Premo White Translucent appears more white than regular Premo Translucent, but still does have a slight tan color. The whiter color of Premo White Translucent is because it contains an optical brightener (as do many translucent and white polymer clays.) Aside from this fluorescent dye, there’s no difference between Premo Translucent and Premo White Translucent. Cernit Translucent is a very clear white clay that bakes up smooth and clean. It can be quite stretchy and sticky during conditioning and can be a challenge to handle if your hands are warm. It bakes nicely to form a translucent result that doesn’t have much color cast. Baked Cernit is quite strong. You can see examples and read my review of Cernit polymer clay here. Kato can be quite a challenge and some people won’t work with it because it can be stiff and harder to condition. It takes color additives very well, though, because it doesn’t get sticky easily. But it’s not particularly clear. It bakes up fairly shiny and is quite hard once baked. Probably the least useful of the translucents unless you’re going to be using it in a cane. The darling of the polymer clay community, Pardo translucent can be a challenge to condition because it crumbles easily and sheets tend to crack rather than stretch. It slices well and doesn’t get sticky. It cures quite clear and without color. Pardo tends to end up with small bubbles once it’s cured. Pardo is often quite opaque when it first comes out of the oven and will clear rapidly as it cools. Pardo, cooked at much higher temperatures than the manufacturer recommends, can come out VERY clear. Pardo is very strong once baked and can be made into thin sheets and tiny projections which will not break off. If you have trouble conditioning your Pardo, don’t assume that it’s too old. Read about how to condition Pardo Translucent. I’ve heard that Pardo Art Clay is the clearest, is this true? Please refer to the article that I wrote about this. When baked at the manufacturer’s recommended temperature, Pardo Art Clay is very clear, but Premo White Translucent and Cernit are equally clear. When baked at very high temperatures, far beyond what the manufacturer recommends, Pardo Art Clay is remarkably clear, clear enough to read through. Is translucent polymer clay hard to work with? Translucent polymer clay is an uncolored body of clay, without any pigment added. Because adding pigment to clay is a bit like adding flour to cookie dough, colored polymer clay tends to be a bit more stiff, translucent clay a bit more soft and/or sticky. Depending on the brand, this can be somewhat of a challenge. Another frustrating thing about dealing with translucent polymer clay is that any stray fibers or dirt or contamination from other clay colors on your hands or pasta machine can get mixed in with your translucent clay and it’s instantly visible. Use baby wipes to keep your hands and pasta machine spotlessly clean. And use a scrap lump of translucent clay to clean your hands and pasta machine between colors. Here’s so more information about keeping lint and dust out of your clay. What can I make with translucent polymer clay? I think the polymer clay community is just beginning to scratch the surface on what can be done with translucent polymer clays. I’ve gathered some examples of beautiful works using translucent polymer clay on this pinboard on Pinterest. I also have another board specifically for items created with Pardo Translucent Art Clay. And for specific instructions, I have written a very comprehensive 70 page tutorial showing how to get five different Faux Glass Effects. Translucent polymer clay also works nicely to make Faux Lampwork beads and pendants. Plaquing, also known as mooning, is a pattern of little pockets of air that develop inside of some brands of polymer clay as it cures. All brands and colors of clay will do this. It is a quite predictable pattern of approximately 1/8″ “moons” that show up. Really only visible in translucent clay, plaques don’t seem to be caused by air pockets trapped in the clay during careless conditioning. Rather they seem to be due to gases forming during baking and thicker pieces suffer more. Plaques can be used to great advantage when making faux stones such as jade or opal. Plaques can become quite numerous if the air is very humid where you are. I tried translucent polymer clay once, but it turned brown. Why? All polymer clay can turn brown when baked too hot or for too long, but it’s going to be more visible and apparent when using translucent clay. To prevent this, make sure you use an oven thermometer to ensure your oven is baking at the correct temperature. It is also important to cover your items when baking. I like to use two disposable aluminum pans, one inverted as a lid, clipped together with a binder clip. Alternatively, some people like to bury their beads in baking soda while baking as this protects them from the heat as well. Be aware that reducing the temperature below what’s recommended will cause your clay to be underbaked and therefore brittle. For more information about baking your polymer clay creations, check out this four part series on baking polymer clay. Where can I buy translucent polymer clay? You can buy translucent Fimo, Premo, and Sculpey III at most hobby stores in the US and Canada. Kato Polyclay is carried by Hobby Lobby. You can get Cernit from Clay Factory and Kato Polyclay from Munro Crafts. There are many other suppliers, too. Check out my article on How to Buy Polymer Clay for a list of my favorite online polymer shops. In the UK, you can find Cernit at EJR Beads. You can get Kato, Premo, Fimo, and Pardo from Penny at Clayaround. In Europe, have a look at Happy Things in The Netherlands. For more detailed information about sourcing Translucent Pardo Professional Art Clay, I do try to keep updated at Where to Buy Pardo Translucent. I work exclusively with kato clay and it has now changed it’s formula, way softer to work with unless you get an older batch. It is certainly softer than it used to be, that’s for sure. But I don’t know if I’m getting old clay or that the shelf life isn’t very long on the new clay that I’m buying, but I do find that Kato is stiffer and more crumbly than the other brands. But yes, I have had some packages be smooth as silk. Additionally, this shop (http://www.polymerove-hmoty.cz/default.aspx?stranka=kontakt) in Pilsen, Czech Republic carries Pardo and I KNOW they carry plenty of Cernit, as I visited the shop while in Pilsen for the Kathleen Dustin workshop sponsored by the shop. The Pardo translucent goes for $2.80 a pack. Oh, P.S. — The shop in the Czech Republic also carries Tim Holz’s alcohol inks. The proprietor, a wonderful polymer clay artist herself, speaks very good english and is happy to communicate via email (phone, too, I imagine) to answer any questions. Thank YOU, Karen for the updates! This is just the kind of information I was hoping someone would provide. I hate it when Americans forget about the rest of the world and I’m glad you were able to help fill in the missing info a bit. Ginger and Viv, glad to help. I’ll be moving a bit closer to France, soon, so if you’re not too far from Kaiserslautern, Germany, Viv, you could come over for a polymer clay play date! We’ll be in a village outside of there, and I’m hoping to find some service members’ wives or service women whom I can interest in polymer clay. I’m so flattered to see some of my covered glass pieces on your Pinterest board about translucent polymer clay! Thank you so much for including them. And I was actually planning on going back and pinning a few more. I love your beautiful votive candle holders. Translucent clay is just wonderful for letting the light through and you’ve done a great job playing with design. Oh my gosh Ginger, thank you so much. I just bought some black alcohol ink from Dharma Trading Co. and I can’t wait to experiment to see how the light works with it. Could be great, could be a dud, either way I am going to find out! Thanks for all the great info, Ginger! Your transparent clay pin board is quite inspiring! I’m glad you enjoyed it. I pinned a whole bunch more on there today, so check back on it. If you’re looking for Cernit, you might try Hobby Lobby in the United States. I have been able to get it regularly at my Hobby Lobby store. Hi Kim, was that recently? My local Hobby Lobby used to carry Cernit, that’s how I got started with it. But they discontinued it about a year ago…got rid of Pardo too…and now all they have is Kato, Fimo, Sculpey, and Premo. I sure hope my store is the odd man out, but I don’t see it on their website. Let me know if you can still get it…that’d be really great news! I live just outside Dallas, Texas and the Hobby Lobby stores here do not carry Cernit at all. They just carry Premo, SculpyIII, Katowice, and Fimo. No, I haven’t seen Cernit at Hobby Lobby for a few years now. But they do carry Pardo Trans. What temp do you bake the Pardo Transluscent at to get the clearer effect you were mentioning? Basically, you bake it as hot as you can without getting too much ambering. If you get more yellowing than you like, then it’s too hot or you baked too long and next time try a lower temp. I know that it can easily withstand actual temps of 320°F for 30 minutes without toooo much trouble. But even when cured alongside Premo at 275°F, you’re still going to have a much more clear effect than when baked according to the label (248°F). Baking it hot like this, however, you MUST cover it with some foil or a lid. Thank you for wonderful article. I love your style and easy way that you present information. I am mostly using Fimo clay and I am happy with their translucent clay. It acts really nicely and it is easy to work with. I used Cernit back in 2008 in several occasions and it was too soft, too sticky and I did not like it. It was just awful. I did not touch it again until 2014. I must say I was pleasantly surprised. It is wonderful to work with and I especially like translucent clay. It can be rolled trough the thinnest setting on the pasta machine. It is easy to work with and I did not experience flakes or trapped air. It is clear when cured and looks pretty when sanded and buffed to a high shine. Hello, can you please tell me, can I use the liquid translucent clay with the “solid” clay (like mix them together)? I’m about ready to give up TOTALLY as i can’t get my sketches into reality. I baked FIMO TRANSLUCENT Polymer as the required time and team and not only did it turn a dark gold (yes, i had it covered and on a ceramic tile, not preheated) but it STAYED SOFT and floppy! It was thin, about 1/2” x 3” x1/8”…i had better luck with PRIMO TRANSLUCENT, a cloudy gray white…i heard Prado translucent is clearer than the others and saw it on your charts, but going GOLD and soft? I rebaked it with other pieces another 20 minutes but no change. I’m so bummed. I followed a tutorial on a bracelett that had it baking 20-30 minutes at 5 different intervals of building it, so i understand that more heat is ok, and you mentioned that some bake their translucent up to 300 degrees so i’m Not sure why temp is an issue…and that some bake it up to an hour. I am not sure what the problem is or if fimo just does this? HELP. Fimo translucent is one of the most temperature sensitive clays there is. It turns pinky orange when it’s baked too hot. In fact, it’s hard to use Fimo trans because there is a fine line between being hot enough to be a strong cure and too hot to remain uncolored. It’s best to be used incorporated into other colors to make translucent effects where color does not matter as much. Knowing the actual temp in your oven and being able to control it is imperative if you’re working with translucent of any brand. That being said, some brands are, indeed, better at higher temps. But not Fimo. As for staying soft, that is expected. Polymer clay is vinyl and the more flexible brands (Souffle, Fimo, Cernit, Premo) will be quite flexible when thin. This is actually a sign that it’s fully cured. Undercured clay will not be flexible – it will just crack and break when you try to flex it. Thinner pieces, of course, will be more flexible than thicker pieces. If you need your clay to be rigid when so thin, then you’ll need to use Kato Polyclay. But Kato’s translucent is really dark and not good for this use at all. Pardo is quite strong when baked, but it will still be flexible. If you’re making a cuff bracelet you will almost always need to either incorporate a closure or build it upon a metal base.